The use of colored water cannons against participants in a demonstration is an old police force technique increasingly widespread. Apart from dissolving the group, it aims to tag the individuals for subsequent identification. It is a primitive form of current digital tracking technologies, as the ones that have come to light parallel to the massive demonstrations of citizenship all around the world these last years. The installation stems from this double nature of the digital: on the one hand, it helps collectivities to emerge; but on the other, it has an unusual power to track the individuals. Next to an image of a colored water cannon against groups of people, a vertical projection lightens an aerial photograph of a demonstration. 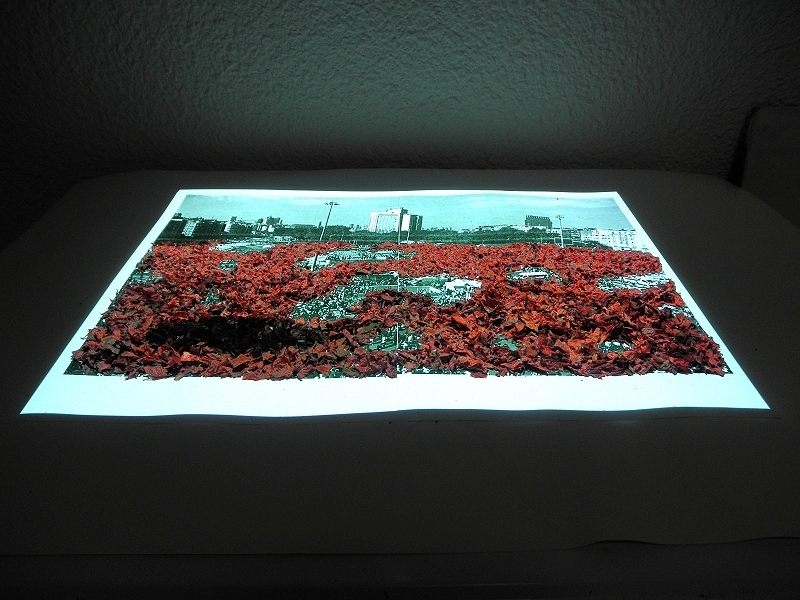 Over it, a layer of fragments of colored petals cover the area occupied by the people in the picture. The projector, with the aid of a computer, maps the petals over the image and, while making them glow, fictionally introduces a surveillance-like moving shadow, a hovering elliptical drone-like presence as an ubiquitous scanning machine.